‘Kevin (Probably) Saves the World’ star Jason Ritter weighs in on why his new hit dramedy has resonated so well with viewers. Larry King: You've called this show hopeful and optimistic. Jason Ritter: Meaning it sort of seems to be about how doing little kind things for people can change their lives in unexpected ways or if not wildly change their lives, gently guide them in a more positive direction. It's about the power of that. Larry King: It's a comedy too, though? Jason Ritter: It's a comedy, yeah, it's super funny and weird. Larry King: Now Kevin leaves Wall Street to do what? 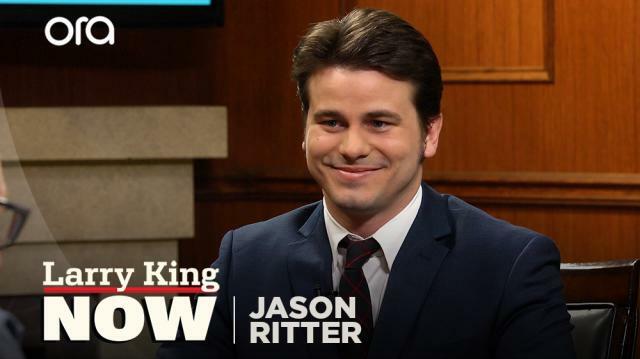 Jason Ritter: To, well initially, he doesn't know what he's doing. At the beginning of the show, he was on Wall Street, he became super depressed at a certain point, he attempted suicide and was unsuccessful. Larry King: It doesn't sound funny yet. Jason Ritter: Not funny yet, no, not at all, and he moves back in with his sister, his twin sister. So he's sort of just kind of at the beginning of the show, he's kind of licking his wounds, and sort of reevaluating his life, and he's always been sort of a selfish, self-involved kind of person. And this woman appears out of nowhere that no one else can see and tells him that he's tasked with saving the world, and he has to do these little things, and that sort of becomes his job. Now he's a substitute teacher as well. Larry King: So he helps save the world? Jason Ritter: He's trying to. Larry King: This woman that we don't see, do we see her? Jason Ritter: Yeah, the audience sees her, and no one else does, yeah.